Genuine GHD MK4 hair straightener complete with hologram. Factory sealed box. 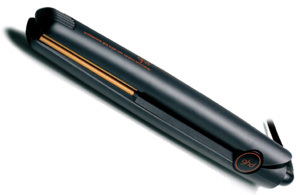 Model MK4 - the latest version of this best selling ceramic iron, the GHD Professional. The GHD iron allows you to produce professional results at home. GHD hair straighteners transformed the world of hair beauty and their irons have become the must have accessory for women everywhere. It comes as no surprise that the new MK4 GHD ceramic straightener was one of the most anticipated hair products ever. Firstly we had the limited edition pink MK4, now the new black MK4 replaces the trusted 3.1b. Compared to the existing mk3.1b model, this next generation Mk4 GHD hair straightener has an extra sleek design, advanced performance and some clever new features which make it better than ever for straightening, smoothing and styling hair. Key features of the new MK4 GHD hair straighteners include a more responsive, deeply sprung ceramic plates with even faster heat up time. It now beeps to let you know the iron is ready for use. With a more durable cable with an improved design to reduce damage as you style with the iron. Auto detecting voltage means you can use your iron in any country and automatic shut off after 15 minutes of non-use. The GHD hairstraighteners are the best selling hair straightener in the UK. The GHD mk3 straighteners have now been replaced with the new ghd hair mk4 straighteners. This is the latest and most advanced GHD hair iron. See the full range of GHD products.